Features all-brass H-2785.DB super pump for reliability and faster operation. Low maintenance air meter. Similar to H-2786 except no moving parts inside chamber. 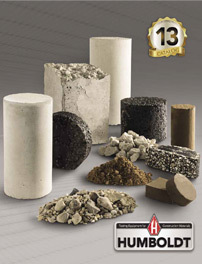 Determine air content, specific gravity and free moisture test of aggregates. Used for the rolling method of measuring entrained air in any concrete. Complete kit for measuring air content of fresh concrete. For quick field checks for air content of fresh concrete in about three minutes. The Super Pump's all brass construction resists acids in cement.